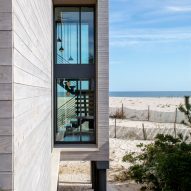 American firm Specht Architects has built a cedar-clad house on New Jersey's Long Beach Island that is raised above the sand on stilts. 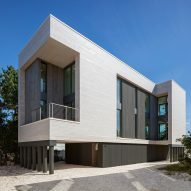 The 2,500-square-foot (232-square-metre) Beach Haven Residence is nestled the tiny borough of the same name on the barrier island that separates the Atlantic Ocean and the mainland. 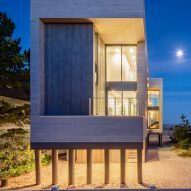 "The lot is on the beachfront, but very small, tucked away from the street, and had many code-regulated square-footage and height restrictions," said Specht Architects. New Jersey's coastline has zoning restrictions limiting residential construction to two storeys. The nearby Sea Bright House by Jeff Jordan was also built to comply with this. "The challenge was to create something open and light-filled that takes advantage of its beautiful setting, yet uses every available square inch of buildable area allowed by law," Specht Architects said. Made with a fibreglass roof, hurricane-grade windows, cedar siding, and stainless steel components, the house is built to withstand all types of weather. The lifted structure has a pebbled carport underneath with enclosed steps leading up to the kitchen, dining, and living rooms. On the first floor is a TV room, guest bedroom, and two separate deck spaces on each wing – one with a hot tub and one facing the beach. Light plays an important role in the interior design, with numerous large windows bathing the spaces. A collection of artificial light fixtures in each room range from grey orbs floating above the couch to the installation dangling through the stairwell, all of which accent the home's open-plan ground floor. The main feature is the stairway, which structurally juts out from the rest of the building. It is supported by stilts to create a protected space for storage underneath on the street level. 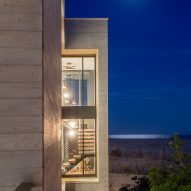 Made of thick wood boards and black metal, the staircase is surrounded by floor-to-ceiling windows that provide views of the ocean and the sunrise. Upstairs, three children's bedrooms line the hallway with identical layouts of a single bed and a side table. A detached bathroom and laundry are located down the hall. At the far end, a master bedroom faces the water and features a fireplace, an en-suite bath and a private balcony. Specht Architects was founded by architect Scott Specht, and has offices in New York City and Austin. The firm also recently completed a beachfront villa in Tulum and a concrete home in Santa Fe.